We're now live with our new Toronto Mike logo. That's right, I'm using words like "we" and "our" to make this look like it's more than one guy. The clever ones will see through the facade, and the others will just be impressed. 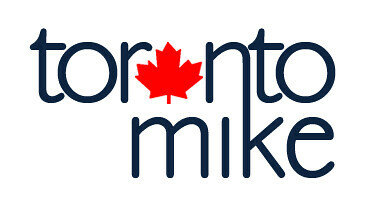 Here's a bigger view of the new Toronto Mike logo. Where's the "link" on the side for Links to other sites? The links page lives on, like many pages not linked to from the sidebar. You'll find it at http://www.torontomike.com/links.html and if you're looking for all links to all pages, you should check out the sitemap at http://www.torontomike.com/sitemap.html . I like it better with the red leaf as it seems brighter. Mike, I want the links back. I'm too lazy to visit your bud's without you showing the way every time. Fred and Hodge. Are they not paying you enough? I like it too. How did your old logo look like again? I remember when you asked everyone with a webpage to include YOUR site as a link for "Toronto Blog". Of course you never reciproated. I remember when you asked everyone with a webpage to include YOUR site as a link for "Toronto Blog". Of course you never reciprocated (sp). I think the Leaf should be Maple Leaf Blue - after the knock on my Canucks I find you to be regional, and the logo implies national. I don't know. I'm blind. I can't see the logo. Not a fan of the N/K mashup.. or the E.. reminds me of Avatar for some reason..
never criticize without suggesting something..
Kinda liked the blue one but the new one's ok.
Mike, I sent you a message a week or so ago with the error message that I get trying to post from home. Any update? Reciprocated? The idea there was you could drop your link in the comments.... so your comment would be "I'm CQ and I blog at www.whatever.com." Also, and this is a good tip for everybody, if you have a site put that url in the url field when you leave a comment because people will click through your name to see what you have going on. I notice you don't do that, CQ. The Links link is back, but now I've got to find 10 minutes to update that page. I don't think I've maintained it very well. I like the new logo, but I think I prefer the altered version that Jonathan presented. If you did keep your version (which, hell, what do I know), I'd atlest break the N from the K...just looks odd. Please email me your IP address at home. It's likely in a range of blocked IP addresses where spam used to come from. Was the link issue a "New Coke" kind of marketing ploy? I wish I was that smart!